When I first set up my studio at the Courtyard Studios in Irvine, my work was based around the man made landscapes of the town and its Harbourside area. Although I’ve been a keen hill-walker for much of my life I’d never combined the two interests of walking and painting. By 2004 though, we were getting out into the Scottish hills on a very regular basis and it was while out on what was my very first real winter walk with our local mountaineering club Air na Creagan, (check out their website www.craggy.org.uk ) that it suddenly dawned on me that I was missing a trick and that I really ought to use my experiences whilst out in the landscape, as the subject for my paintings. By this time I’d started to get a bit of a reputation at the Courtyard; if the weather was fine I would not be found in my studio …..I’d be out on a hill somewhere! So then, it made perfect sense to start painting the wilder parts of the Scottish landscape ….and of course, now my days away on the hill could be called research work! As I’ve said in the past I’ve been invited to put on a solo show of work at The Strathearn Gallery in Crieff for a month starting on the 12th of February 2011. For anyone who hasn’t visited this gallery, it’s a fantastic space and Fiona (the gallery owner) has said I’ll need around 40 – 45 pieces ….so quite a lot of work. As Crieff is situated close to the wild heather clad moors around Loch Turret, it seems to make sense to try to do some paintings based on this area for the exhibition in February. 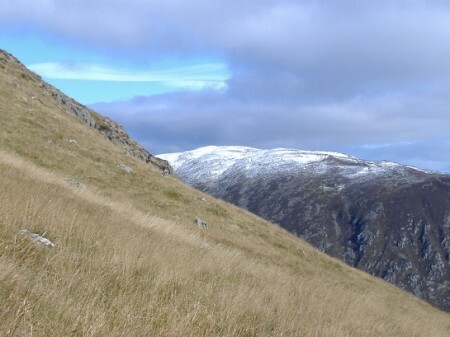 Anita and I visited Loch Turret back in the late winter / early spring and had a wonderful day wandering the hills. At the time there was still quite a good deal of snow around and the loch was completely frozen …it was some sight. So then, last Sunday we decided to head back there and to do a bit more wandering. I hoped to see it in its autumn colours and to perhaps do some sketching and take some photos. The forecast for the weekend was for sun and cold northerly wind ….and for the chance of some snow on the higher tops …especially further north. As it turned out Nita spotted the snow up on our hills, from just north of Stirling on the A9. It looked quite wintry and it didn’t seem any time at all since I was complaining about the heat over in Speyer …where had all the time gone?! When we got to the dam everything looked beautiful with the autumn colours of the grass, bracken and heather on the lower slopes and the bright white of the snow above about 700m. But there was a biting cold wind blowing down from the north and I decided that there was little point in taking the sketch book – it would be just too cold. We followed the same route as back in the spring and although in the wind the conditions were quite severe, once out of it and in the sun, it was really very pleasant. Oh well, too far to go back and get the sketch book. But the light and colours were great. 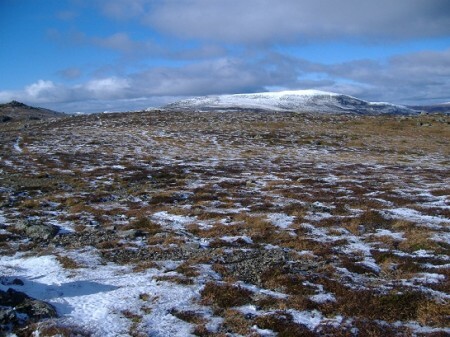 As we got near our high point at a little over 750m we were just into the snow and Ben Chonzie, a couple of kilometres further to the north, looked quite white. 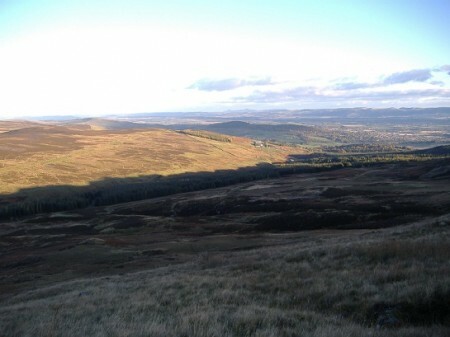 We took a rather circuitous route back, but one that gave us great views down into the strath below. The sun was getting very low as we descended the steep slopes back to the dam and the hillside opposite was coloured vivid yellows and ochres in the late light. It was quite an end to the day and I have come away with a number of ideas for new paintings. Quite a good day’s work!